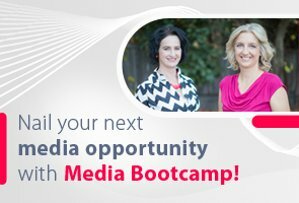 You get the undivided attention of an experienced journalist currently working in the field. I am a wealth of knowledge (particularly on issues facing freelance writers) and can answer your questions, identify any weaknesses in your writing, and ultimately help you to fast track your success. This sounds great! So if I sign up for mentoring does that mean that I have access to you 24 hours a day, 7 days a week to ask you questions? No, sorry! Not even my mother gets that privilege. As a busy working journalist, I must be very careful how I manage my time. During the booked mentoring session you will have my undivided attention and I will be able to answer as many questions as you pose to me in the allotted time. During the booking process you will complete an online questionnaire that will help our session run smoothly. This questionnaire will be access via a link emailed to you after you have booked and paid for your session. Here, will be asked to outline your goals for the session in advance and in the email with the questionnaire link you will be given some tips on how to make the most of your mentoring session. This will not only help clarify your objectives, but ensure I am able to give you the most value during our session as I will know what to be prepared for. Good to remember: Outside of sessions, I don’t have the ability to be answering emailed/follow up questions, as I’m busy meeting my own deadlines. If you forget to ask me something, you’ll have to hold onto it until your next session. Got it, I’m ready to book. Do I get any support after the mentoring session is complete? Unfortunately, I don’t have the capacity to do follow up outside of your session. During each and every mentoring session I do my utmost to ensure you don’t leave with unanswered questions. If you forget to ask me something, you’ll have to hold it until our next session, or I will simply look forward to seeing your next byline out there! Can Sue take a look at sample of my work and give me feedback? Yes. In all sessions except the basic ‘solutions session’ you can email me up to 3 documents (in the one email please) that I can look over prior to your session. Please choose the right session for your needs. I recommend you upload a variety of different documents. For example, you might send one or two pitches you intend to email and a draft of a feature piece you are working on. You’ll send these documents once you’ve booked and paid for your session. The solutions session and writing tune-up are each 50 minutes long. Premium mentoring sessions are 75 minutes long. It’s up to you which you choose. You’ll find we get through quite a lot in 50 minutes, but feel free to book a longer session if you think that’ll be better for you. Are the sessions conducted face-to-face, or over the phone? Sessions are conducted over the phone (mobile or landline fine) or via Skype (perfect for those who live abroad). When you confirm your booking, please specify your preferred contact number, as well as an alternative number just in case. I will then call you on that number during your scheduled session. What happens if we run out of time and you haven’t answered all my questions, concerns or goals? The nature of mentoring means that we might spend more time on one topic than another. We will start the session addressing your number one goal, and work from there. If you feel like you need longer than the 50 minutes offered in the solutions session or writing tune-up, then opt for premium mentoring at 75 minutes. If other questions or concerns arise after your session, and you would like to talk to me further, then feel free to sign up for another session! What is your cancellation policy? Can I get a refund or reschedule if necessary? There is a strict cancellation policy! If you need to cancel or reschedule seven days or more before your session, that is fine. Just email reachsuewhite AT gmail.com and let me know. If it’s fewer than seven days you are locked into this time as my schedule books up quickly in advance and someone may have already missed out on the session. Can I sign up for two consecutive sessions at once? (I.e. Two 50 minutes sessions back to back)? Technically you can, but I wouldn’t recommend it. We will be covering a lot of information in each and every session, so come prepared! I recommend taking one to two weeks between sessions to digest what we’ve covered and put your plans into action. I’d love to be a freelance writer, but have no experience. If you have no writing experience, I highly recommend you take a course at the Australian Writers’ Centre before mentoring. The Centre offers a variety of courses which are well-designed and economical. 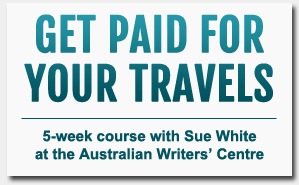 As a bonus, graduates of the magazine and newspaper writing course and the travel writing course get exclusive access to an online writing forum for continued support (a closed Facebook group set up by Australian Writers’ Centre). In my opinion, that’s a pretty amazing offer for a short course. After completing the courses, you might be interested in doing some extension work to fast track your success or follow up on any specific questions or concerns. Mentoring provides a great way to meet these goals efficiently. I write mainly for pleasure, but want to improve my skills. Sure; just remember my experience is mainly in writing feature articles, that is the stories you see in newspapers, magazines, blogs and online. I’m also very experienced in writing for the world of work. You’d still recommend you do one of the above courses to avoid me needing to explain things from scratch during your private mentoring session. Regardless, feel free to book in for a session. I will look forward to meeting you. I write at work, but also like to write features or blog in my spare time. The style of writing required for business and features is different, so it is better to work on these separately. If you’d like to work on your business writing skills, then check out the writing at work training I provide through my copywriting agency. This is tailored to the corporate world. 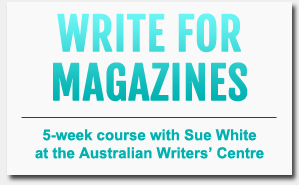 To improve your blog or feature writing, consider the courses available through the Australian Writers’ Centre, then sign up for a mentoring session once you’ve soaked up all that initial information. Can you outline what a typical mentoring session would be like? Each session will be tailored to your needs. We will begin by discussing your first goal of the session (outlined when you fill in the online form – you’ll receive a link to this after your booking and payment is confirmed), and talk through any issues you might be having. During our discussion you can ask me any questions you like. Ask me about pitching, about whether your ideas are strong or how you can better manage your time as a writer. The choice is yours. I will also give you tips and suggestions based on your goals. Once you feel satisfied that all of your questions and concerns have been addressed on your first goal, we will move on to your second goal. The session will continue in the fashion until your scheduled time is complete. This is just an example, and your session may run slightly differently. I find that the sessions evolve organically, and one topic usually leads to another through our conversation, as we address your goals. Will I need to take notes during the mentoring session? Yes, I highly recommend you take notes during the session! I will be giving you a lot of valuable information so jotting down dot points to help you remember is essential. Can I voice record the sessions with Sue? Sure. I recommend using a digital voice recorder and putting the phone on speaker. Or anything else that works at your end. Remember, I’ll also be recording the session for you and sending you an audio after we finish. I don’t want anyone to steal my ideas and am nervous about uploading my documents. Are they safe in your hands? Any work uploaded is completely confidential and will only be used for the purposes of mentoring. Rest assured, your ideas are also safe with me! Can you help my work colleagues improve their writing skills? I run all sorts of private, tailored writing courses for your colleagues: details are here on the website of my copywriting agency, The Comms Collective.